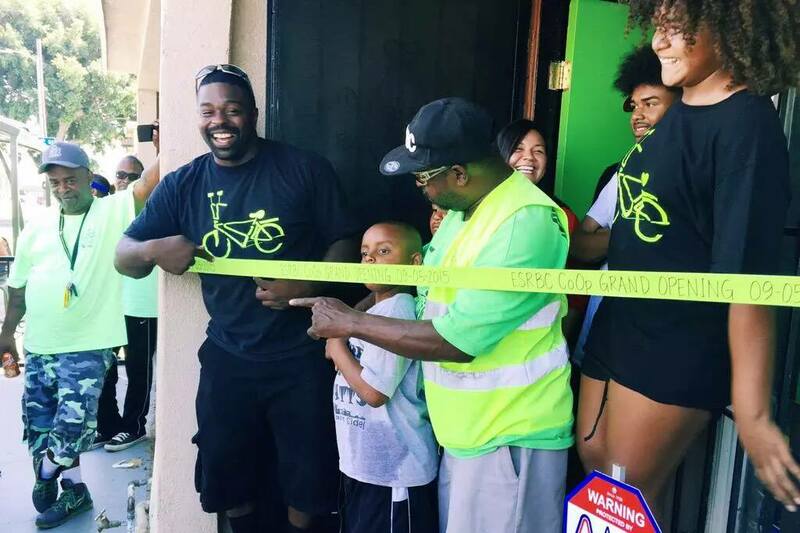 This past weekend, the East Side Riders Bike Club (ESRBC) celebrated the ribbon-cutting on their brand new bike co-op and shop located at 11321 S. Central Ave. in Watts. 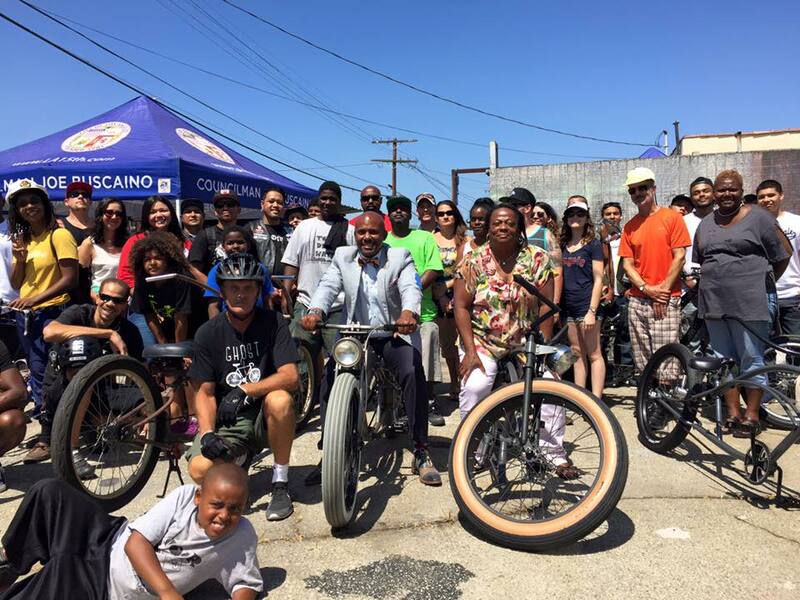 The event launched with a short bike ride through the community, including a stop at the Watts Towers, before ending up back at the co-op site for a celebration featuring music, a barbecue, and the raffling off of bikes and ESRBC gear. For someone like myself, who has been tracking the growth of the ESRBC and the South L.A. cycling scene for the past several years now (see here, here), the ribbon-cutting was a welcome milestone for more reasons than one. Yes, a bike co-op is sorely needed in a lower-income community where bikes are essential for transportation and getting a popped tire fixed can be too expensive for those who are really on the margins. And the safe gathering space, strong role models, and access to bike maintenance skills the space will provide for youth from a wonderful but struggling community is also much-needed. But the wide range of groups that came by to support the ESRBC — including members from Black Kids on Bikes, The Others BC, Syndicate Riders, the South L.A. Real Rydaz, Barkada, the Eastside Bike Club, Los Ryderz, and the Ghost Bike Documentary folks — signaled that the bike community that has been on the rise in South and Southeast L.A. was continuing to grow and expand its reach. Supporters gather for a photo after touring the community. Photo courtesy of the East Side Riders. It’s not that the groups are new — most aren’t. Or, at least, the riders aren’t new to cycling. 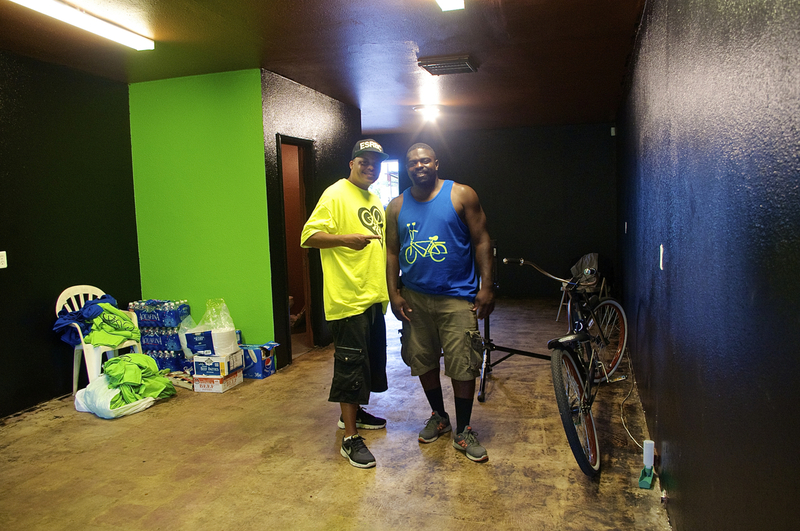 Will Holloway, head of the Real Rydaz and one of the more recognizable South L.A. figures, for example, has been part of the low-rider cycling scene since 1990. But the way the clubs have come together to support each other over the past several years has been exciting to watch, as has been the shift toward using cycling as a way to give back to the community. Los Ryderz, as we’ve documented here, has been active in mentoring at-risk youth in Watts and ensuring they had a positive community to belong to. Black Kids on Bikes, riding out of Leimert Park, has supported the development of the Ride On! co-op there, helping to fix bikes for folks in the community every other Sunday. And the ESRBC has been active in fixing bikes at community events and holding rides to feed the homeless. Members of all three, along with those of several other groups, have been involved in unity rides aimed at building better relations between black and brown communities, highlighting the dangers of hit-and-runs, reclaiming the streets in parts of town where the public space is contested, inspiring youth and families of color to take up cycling, taking pride in their communities, and changing stereotypes about who rides in Los Angeles. The launching of the Watts co-op is a step forward in institutionalizing that spirit of community transformation. It’s also clear that the co-op is something the ESRBC members view as the beginning of a new era for them, not the endgame. Even as he was grilling up food for the event-goers, founding member and former ESRBC president John Jones III was nodding towards the empty building on the adjacent lot and telling me it had inspired dreams of an after-school program site. Fred Buggs, Sr., current president of the ESRBC, mentioned he had just gotten his teaching certification from the League of Cycling Instructors and said he was looking forward to starting safety cycling classes for kids. Given that they and the other club members were clearly exhausted after having spent many late nights getting their new space ready, it was hard to believe they were already thinking ahead. But they have operated this way since launching the club several years ago — they have never been particularly good at thinking small. That inability to think small is one of the reasons that they are so beloved in the community — that spirit of giving is genuine, and it is infectious. And it has helped inspire others in the community to get involved in their cause and lend a hand however they can. As Watts leaves commemorations of the 50th anniversary of the Watts Riots/Rebellion behind, initiatives like the co-op suggest the road ahead is going to be a little bit smoother. John Jones III and Charles Standokes stand in the freshly-painted space a few weeks ago; the floor and ceiling have since been painted. Sahra Sulaiman/Streetsblog L.A.
John Jones III is our Civil Servant Streetsie winner this year. We recently sat down to talk about organizing a ride between the Leimert Park and Watts co-ops, ending in Watts with a BBQ and community party. We’ll have more details once we’ve hammered them out. In the meanwhile, check out this short video (below) that highlights some of the work that Jones and his club do in the community or visit the fundraising page for their co-op, here.